A wide range of health problems can cause chest pain. In many cases, the underlying cause has nothing to do with your heart — though there's no easy way to tell without seeing a doctor. Chest pain may be caused by poor blood flow to the heart muscle leading to angina or by a sudden blockage in the coronary arteries resulting in a heart attack. Other possible causes of chest pain can include indigestion, chest muscle strain and inflammation in the rib joints near the sternum (costochondritis). Chest pain comes in many varieties ranging from a sharp stab to a dull ache. 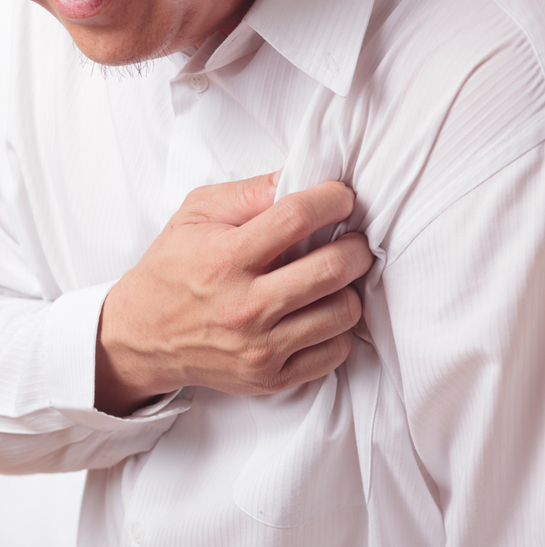 Some types of chest pain can be described as crushing or burning. In certain cases, the pain travels up the neck, pierces through to the back or radiates down one or both arms. Angina is chest pain or discomfort caused by insufficient blood flow and oxygen to the muscle of the heart. In most cases the lack of blood flow is due to a narrowing of the coronary arteries. Angina isn't a disease; it is a symptom of an underlying heart problem. Angina usually is a symptom of coronary heart disease (CHD), also called coronary artery disease. Angina usually occurs during exertion, severe emotional stress, or after a heavy meal. During these periods, the heart muscle demands more oxygenated blood than the narrowed coronary arteries can deliver. Chest pain may be serious and you should always seek medical help to rule out cardiac problems.